A triangular change of masters is reported to have taken place on the Steamers Euryalus, Gracchus, and Clitus, of the Currie line. 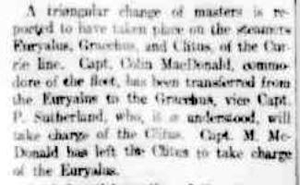 Capt, Colin MacDonald, commodore of the fleet has been transferred from the Euryalus to the Gracchus, vice Capt. P. Sutherland, who, it is understood, will take charge of the Clitus. Capt. M. McDonald has left the Clitus to take charge of the Euryalus.